Leash aggression is an extremely common behavior issue faced by many dog-loving owners. You start on the blissful journey of puppy parenthood, envisioning a future of leisurely strolling with your dog: cup of coffee and newspaper in hand, ready to settle in on a park bench, street café, or just around the neighborhood. Then reality sets in. Lovable Fido often resembles Cujo while on leash. Here’s what is going on. Your dog is probably frustrated and anxious. Very likely, he wanted to run after or gain access to whatever he saw while on the street; it could’ve been a squirrel, other dogs, skateboards etc. That pesky prohibitive collar and leash however prevented your dog from gaining access to these things and over time, exuberant curiosity was replaced with frustration. Your dog needs to release that frustration and voila, the barking and lunging begins. It is very likely that your dog’s initial outbursts were met with some form of disapproval from you. The cycle then begins and now Fido begins to also feel anxious. He begins to think that not only do these things frustrate him, but they make Mom and Dad angry! Now that we likely know the why, let’s focus on how to manage the behavior. In any case of aggression, I strongly advise working with a gentle and humane professional to guide you through this process and teach you about the importance of your timing and consistency. Seek a trainer whose methods are firming planted in reward-based training. 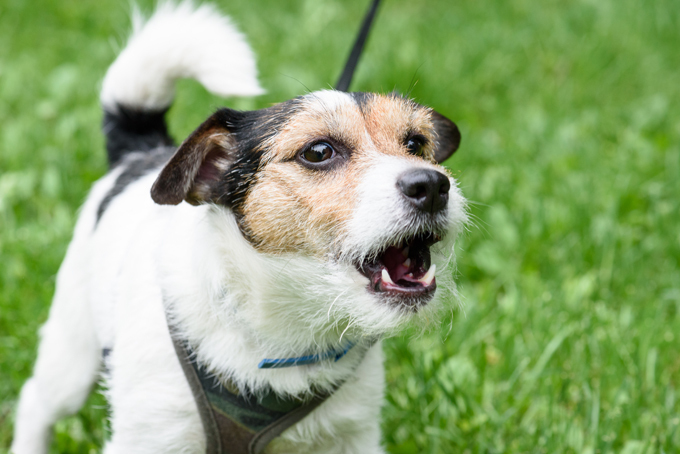 You need to develop a more refined replacement behavior for the lunging and barking. A dog that is quietly trotting along your side, staring into your sparkling eyes is ideal. In order to get this going, you need to be a vigilant owner. It is now your job to scout out other dogs before your dog has the opportunity. You must also be a well prepared owner. You must always be stocked with tasty treats or your dog’s favorite tug style toy. The very second you see a dog (before your dog has the chance to react) you quickly get Fido’s attention with a happy voiced, “Fido!” Give him treats or access to his toy as you get close to and continue to pass the other dog. During this time, it’s important that you remain calm, happy and refrain from tightening up on the leash. We are teaching Fido that both you and he need to relax in presence of other furry friends. Once the other dog has passed and is at a distance, the treating stops or the toy is put away. Learning that you are the giver of all good things, your dog will become conditioned to look at you automatically when spotting another dog. This conditioning will also help improve Fido’s association with other dogs. It is very important, in kicking off this project, to be lavish in your reward giving, distributing treats every second while in sight of another dog. People often immediately retort, “My dog is going to get fat!” Not if you are a good owner and recognize that treats are incorporated into your dog’s daily ration of food. Cut back on what is going into the bowl, knowing that tackling this behavior hurdle is top priority for the health and happiness of both you and your dog. It might take a bit of retraining yourself! 2.Practice “Fido, look!” every chance you get, NOT just when faced with other dogs. Your dog must make eye contact with you for everything he wants in life: before you put his food dish on the floor, snap on his leash, open the door for him to go outdoors, between each toss during a game of fetch. This is your batting practice. The more you and your dog get in the batting cage, the more successful you’ll be at the big game! 3.Exercise your dog. If you have a backyard, play fetch for fifteen minutes before going on a walk. Your dog will be a bit more tired, a bit more convinced that you are cool (after tossing the ball to him), and likely to free less anxious about those other dogs. Work hard and your training will pay off. Sitting at at outdoor café without worry that your table flies out from under your plate as Fido lunges for another dog IS possible. Colleen Safford, of New York Walk & Train and Far Fetched Acres, is one of NYC’s most recognized dog trainers.